Claim the head of a Glenmoril Witch for Kodlak Whitemane. Collect a Glenmoril Witch's head. (Optional) Wipe out the Glenmoril Witches. After completing two radiant quests for the Companions (one of which must be for Aela), your next major assignment will be available, courtesy of the elderly Harbinger himself, Kodlak Whitemane. He will chastise you for your actions against the Silver Hand, and will then tell you the true story about how the Companions contracted Lycanthropy. 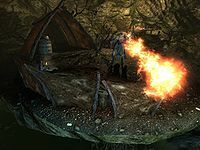 Apparently, one of his predecessors made a pact with the Glenmoril Witches to gain more power, not knowing the true price of his actions: an afterlife spent in Hircine's Hunting Grounds, not in Sovngarde. It is this fate which compels Kodlak to seek a cure. He then sends you off by yourself, in search of the Glenmoril Witches. Glenmoril Coven is located in the northwest reaches of Falkreath, southeast of Lost Valley Redoubt. Upon entering, proceed to the main chamber where you will encounter the first Glenmoril Witch, a powerful variety of Hagraven. She will attack you on sight, accompanied by a Frostbite Spider or Skeever. After the battle, claim her head. The chamber functions as a nexus to four smaller chambers, each with a witch and some valuable loot. The Destruction skill book The Horror of Castle Xyr is in a tent in the northwestern chamber and the Enchanting skill book A Tragedy in Black is in the northern most chamber. While it is optional to kill all five witches, killing at least four is recommended if you want to cure yourself of lycanthropy later on. Despite the described weight of the heads, no weight penalty is added when you pick them up as quest items. When you return to Whiterun, things will be different and you will notice several citizens gathered around near the stairs leading to Jorrvaskr. Halfway up the stairs, you will find both Torvar and Aela the Huntress next to dead Silver Hand members. When you enter the building, Vilkas will seek you out and ask you where you were in the time of need. In your absence, the Silver Hand attacked Jorrvaskr, managing to kill old Kodlak and take off with all the fragments of Wuuthrad. You will find Kodlak's dead body near the central fireplace, with Farkas and Njada Stonearm kneeling next to him; both unresponsive. Vilkas will claim that his death will be avenged, which will end the quest and immediately start the next one, Purity of Revenge. If you have a follower prior to completing this quest, he/she will be replaced by Vilkas once you enter Jorrvaskr at the end of this quest. This will cause your previous follower to "reset", meaning they will return to their respective origin, and will appear again as they did when you first met. However, any items that were given to them will still be in their inventory if you return later to regain them as a follower. Kodlak's body cannot be interacted with or searched, as he becomes a "ghost". Regardless of whether you kill all the witches or not, the guards will praise you upon the completion of Blood's Honor. After finishing the two radiant quests for Aela, Blood's Honor may not show up, as Aela won't initiate the quest. This may be caused by a conflicting radiant quest which is already active at Glenmoril Coven. Attempt to complete the radiant quest as early as possible and it should function as normal. 20 As part of his quest to cure his lycanthropy, Kodlak Whitemane has sent me to kill the Glenmoril Witches and bring back their heads. 200 Finishes quest I killed the Glenmoril Witches at the behest of Kodlak Whitemane, but he was killed by the Silver Hand before I could return. On the PC, it is possible to use the console to advance through the quest by entering setstage C04 stage, where stage is the number of the stage you wish to complete. It is not possible to un-complete (i.e. go back) quest stages, but it is possible to clear all stages of the quest using resetquest C04.